I remember going to school board meetings in Regina and Ottawa (not exactly as shown) in my past life as a reporter. Boring affairs. Lots of empty seats. A few iffy stories. Mostly, I thought to myself, folks seemed more concerned about everyone else’s kids than their own. Not that different than rez parents. I was therefore surprised at the amount of jabber-jabber among non-Indigenous types about the First Nations Education Act (FNEA). First, it’s about (yawn) education. 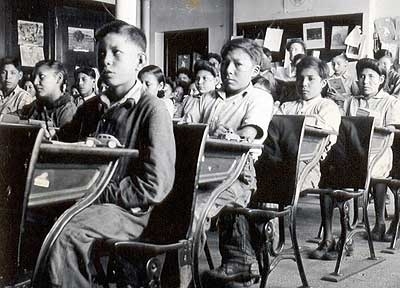 Second, it’s about (double yawn) First Nations’ education. So why all the online chatter? Right now, the topic’s just-a-popping especially after last week’s shocking, surprising, and dare I say (yes I do) historic resignation of Shawn Atleo as head of the Assembly of First Nations. He said he wanted to remove himself as a “lightning rod” for opponents of the FNEA. So what, you say. Why should non-Indigenous types think this concerns them at all? It doesn’t. But they love to tell Indigenous peoples that they’re a bunch of stubborn, misguided arses and that they’re ruining their own lives and those of blah blah blah. Maybe this compensates for frustration, deep feelings of anxiety, impotence and inadequacy at their own lack of control over their own politicians and governments. They got daddy issues, y’see. If they were half as concerned as they claim, wouldn’t they have asked why First Nations students get about a third less money for education than their own kids? Or why so many FN schools sit on contaminated land, make kids sick from mold and other poisons, don’t provide classes in their own languages, or teach their own histories? Sorry. I almost put you to sleep, didn’t I? But isn’t that the point? Knowing all that stuff presumes non-Indigenous folks even care about news from Indian country. Of course, they don’t. Why should they when they got Rob Ford, Mike Duffy and Pauline Marois to entertain and enthrall. Yet, so many non-Indigenous types get their knickers in a twist about FN education on the rez when their preferred teaching method is apparently provided by Canadian prison guards. I mean… really? You can’t have your cake and eat it too. Choose one or the other. Education in schools? Or longer prison terms? Focus, people! I don’t think them hosers are really concerned about FN education or FN students at all. I think they’re really upset about losing control over Indigenous peoples. They’ve a lifetime of comforting stereotypes pounded into their noggins, after all, that “natives” are inferior in nearly every way including how to raise and teach their own children. And ain’t that the very foundation for residential schools? Face it – there are a lot of hosers who think those schools weren’t all that bad. Eh? My point is this. The FNEA and a string of other “historic” accomplishments passed by the Harper Government™ since it took power has been less about First Nations’ fiscal accountability, financial transparency, fair elections, matrimonial property rights, or education. It’s been about the Federal government blocking, limiting, undermining and avoiding at all costs the recognition of some fundamental rights of Indigenous peoples to control their own lives. It’s about centuries of White privilege, and fear of losing a tiny bit of that, should Indigenous peoples escape those legal handcuffs so effectively applied by the Indian Act and other government policies. I mean, just look at the amazing job the Canadian Government’s done so far? Need I say more? Indigenous peoples already have legal recognition of their inherent rights; in the Aboriginal rights sections of the Canadian Charter of Rights, various decisions by the Supreme Court of Canada and other Canadian courts, in the UN Declaration on the Rights of Indigenous Peoples, and under international law. The problem isn’t legal recognition. It’s Canada’s amazing, technicolor, hypocrisy. One the one hand, Canada claims: “we respect Aboriginal rights”. On the one hand, it does its darnedest to tear up those same Aboriginal rights in lengthy, expensive court cases. Even when it’s been handed very clear, definite judicial smackdowns, the Federal Government’s lawyers will appeal almost with malicious intent. There. I said it. I believe government lawyers can be petty and malicious. I hope you’re happy. There seems an unwritten memo floating about the PMO (regardless of political occupant) that says: Deny, deny, deny. Maybe this is why the Harper Government™ is in such a rush to cut Indians off at the pass. It’s a different kind of “red scare” these days. Blogs, reports and studies, and headlines rally the troops to plant flags and stake claims before it’s too late. Do it now – before Indigenous peoples get there and demand a share of the wealth. Or at least a seat at the negotiating table. Sheesh! I mean, the nerve?! Google shows “about 21,700 results” with the words “Canada”, “Aboriginal rights” and “resource development”. A sizeable chunk warns governments and corporations that snoozers are losers. It’s the Harper Government’s™ version of THE AMAZING RACE with oil and mining companies scrambling over themselves to get there before the courts step in. “Thar’s gold (oil and other precious minerals) in them thar hills!” Yee-haw! Doncha think maybe, just perhaps, that could be why so many chiefs are upset at all the backroom deals and private talks going on between the Assembly of First Nations and the Harper Government™? The AFN and PMO can use all kinds of fancy blah-blah about “historic” this and that, or yadda-yadda about saving souls, but we know it’s always been about used car salesmen and Indians getting the sh***y end of the stick. Politics and Indigenous rights – not education or fiscal whatever. Anyone who says different is zoomin’ ya. But can that excuse those who think it must be one or the other – all or nothing – with no common ground? Are these the only choices: assimilation or Indigenation? There are, after all, common Aboriginal rights at stake for adherents of both camps. Protecting and advancing those rights is — and should be — Job # 1 at the AFN. The question is whether this organization of chiefs has been doing that or jumping at carrots dangled by the Harper Government™. Interesting sidebar: more and more people outside Indian country are becoming interested, learning about and debating these issues. Always a good sign. Welcome to the party, y’all. Next Next post: Hail to Freedonia! Well, as I mentioned over on Crackbook, the AFN is funded by the Harper Government, and is by its history and its actions and its mandate a lacky of the government of the day. Imagine, if you will, the Sinn Fein accepting 100% of its funding from the British government back in the day. Then imagine Irish republicans falling over laughing at the mere thought. We will never get anywhere with this structure. We need an independent leadership that probably comes out of Idle No More, that is not funded by or beholden to the Government of Canada (bless its heart). That’s my opinion, for what it’s worth.